1. In a bowl, combine and toss all ingredients until blended evenly with dressing. 2. Serve on salad, vegetables (broccoli, kale, arugula, diced cucumbers crackers, etc) or in a wrap/ sandwich or with vegetables as a dip. I made this as part of a presentation on carbohydrates for the local YMCA Get Fit Central Bucks program in conjunction with the Doylestown Food Co-Op. 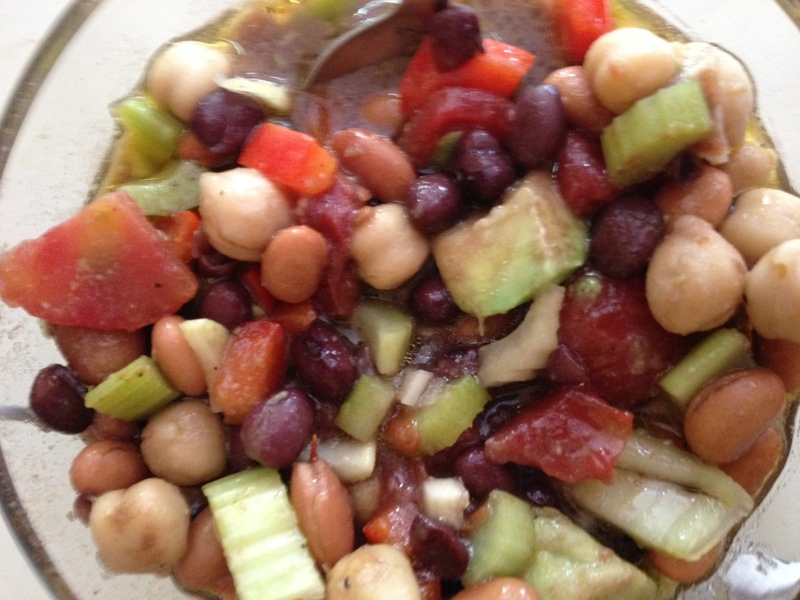 We used pinto, garbanzo and black beans which made it really tasty!. If you do not have real lemons, a bottle of real lemon juice will work, too to make a shortcut. And you can also used diced organic tomatoes like we did as tomatoes are not in season. Funny, but adding the canned tomatoes didn't really add to the salad. We also used dry mustard powder instead of mustard and it worked well! The powder is more portable than a jar of mustard! This is great on a bed of greens! Or add in steamed broccoli chopped up from last night's dinner. Or spoon it onto cucumber or raw zuccini slices for a snack. Many options. All tasty real food treats!